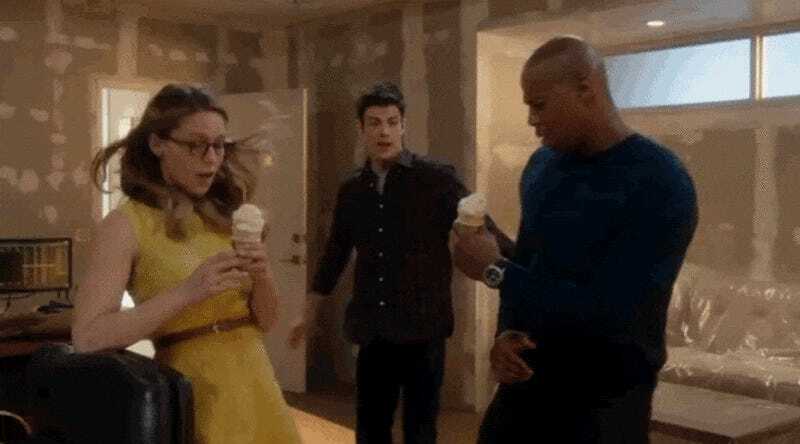 If you thought that there couldn’t be a somehow even more delightful behind-the-scenes story behind the amazing Supergirl moment when Barry brings Kara and James Olsen ice cream, prepare to be proved wrong. The CW panel at the Television Critics Association summer tour was just jam-packed with crazy-exciting news about the channel’s DC shows—perhaps most joyously that Barry Allen and Kara Danvers will be crooning together in an honest-to-god Supergirl/Flash singalong crossover. So a) they changed Barry’s treat from coffee to ice cream just to make it cuter, and b) Melissa Benoist ate three of the ice creams during shooting. Melissa Benoist is not just all of us when looking at ice cream, she is all of us when eating copious amounts of it as well. Truly the best spirit guide humanity could ask for. Between this and the fact she sometimes carries puppies around the set, I’m not sure what else the team behind Supergirl could reveal about Melissa Benoist to make me squeal in delight even more—but I’m looking forward to it. This show is the goddamn best.